Capital Improvements Project (CIP) IS RESPONSIBLE FOR MANAGING PROJECT not the design. 1st part is led by city engineers & design build until CIP takes leadership for actual work. Essentially city engineer prepares guidelines to the design build based on criteria (storm water issues, size of sidewalks, etc) for items that need to be done. Design build-One entity takes responsibility for the design portion. The BODR is a summary of wants and thoughts. Doesn’t mean that it will all be satisfied. This project is to start when construction on Alton road project is completed. DCP is scheduled to be done in the next couple of months. Probably before end of the year and bidding will be done by next spring. Deadline duration of entire project is roughly 2 years. Design about 8 months and 14-16 month actual construction. There is GEO bond money also going into this project. Bike master plan is incorporated into West Ave Streetscape project. New project will minimize lots of greenery in the community. Medians are not in the BODR as of now. We need to discuss the area for greenery. Landscaping is important however it may add/remove other options (sidewalk space, bike lane space). As per Bruce, not everything can be incorporated. We have to decide as a community on what is important to us. In regards to street curves currently in place and/or missing curves, it’s part of design and analysis based on drainage gutters. Certain streets will remain without parking if it makes sense it will be added. City is aware of severe parking problem and there are studies being done but additional parking may/may not work for area. In regard to the questions about landscaping selection. It will be selected and will be submitted to us for review. BODR solution for bike lane is part of bike master plan and discussed in BODR. Streetscape will incorporate whatever is already approved via master plan. Sidewalks will vary depending areas of west ave but average 5-6 feet. Discuss moving valet for Barton G possibly on to the side to alleviate traffic. Raymond from Barton G attended. We should open the idea for pump station beautification. Follow up on artist that has already worked on these projects. City is interested in doing 14th street one time as “sample” of Streetscape project. Anticipating doing that this year for 14th and 10th street end. In regards to questions about multiple vendors. Getting additional vendors can complicate matters as well. Sometimes there’s issues that can arise so you don’t always want that many vendors working at the same time. Discuss the city enforcing proper use of bike lane vs sidewalk for pedestrian safety. 14th street pump is probably operational by end of September/October 1st. August 19th next WAVNA developers presenting. Is the 2007 BODR updated? BODR is a concept, not a final design. There are currently no updated versions of the 2007 BODR, however, there will be changes to the BODR throughout the design stage. How can we prevent trucks on the new West Ave Bridge? You cannot prevent trucks. How will the painted medians be treated? Will there be hard medians? There will probably only be painted medians. How do we prevent delivery trucks from parking in the center painted median? Code Compliance Dept. Can curbs be added to street that do not currently have curbs. For example, curbs are missing on Flamingo Way and 14th Terrace. Not planning on building curbs where none now exist but will consider it. 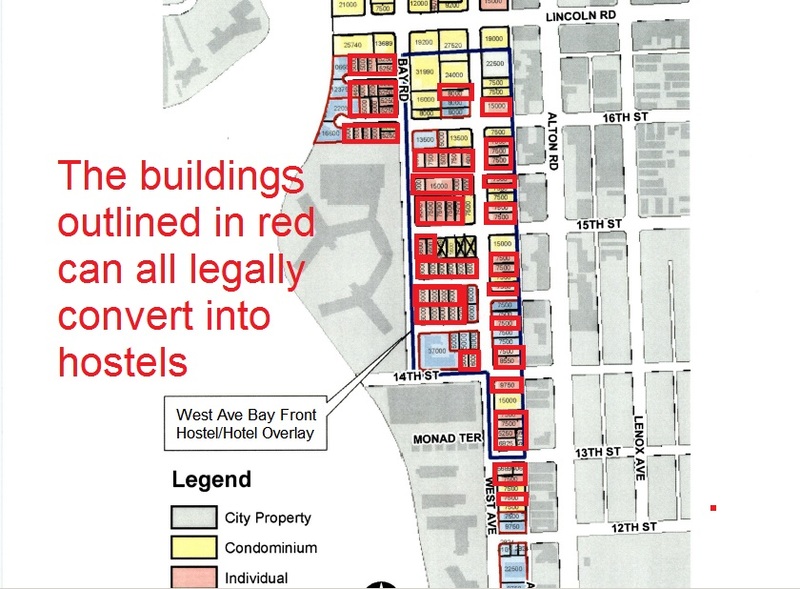 Can street parking spaces be added where the single homes are located? Single family homes don’t like this so probably will not build parking spaces here. We prefer shade trees versus palm trees. You can have shade trees. What is best solution for a bike path? A 5 foot wide bike lane is planned but we will build whatever is decided in the Bike Master Plan which is now being revised. How wide will new sidewalk be? How wide is current sidewalk? Currently 5 feet wide , will be 6 feet. And the grass between the sidewalk and street will be removed and become part of the sidewalk. How can we eliminate sign poles and other obstacles in middle of sidewalk? We have every intention to remove obstacles from the middle of the sidewalk. How can we improve valet parking at Barton G? I don’t know how we can do that but we will look into it. How to hide or beautify pump stations at streetends at 5th, 10th, 14th. We will consider your idea to have an artist paint the electrical panels. How can we speed up the project? We have already begun to install the West Ave pumps stations. Can we hire two or three vendors instead of one to help speed up the construction? The Design Build contractor will hire 4 sub contractors but adding subs does not speed up project. How can we prevent on West Ave what is happening on Alton project – same road dug up and re-paved 4 times. And entire streets closed yet no work taking place. Cannot prevent this, except 10th and 14th Street will be dug up soon and only once. Can West Ave have red faux brick crosswalks like Alton Rd? We will make some sort of design at the crosswalks. Will any property owner?s fences or hedges we removed to accommodate the wider streets and sidewalks? Yes, if those fences are in the public right of way. The orange pole barrier at 1) West Ave and 17th and 2) West Ave and MacArthur Causeway are helpful. Will these pole barriers remain? We will consider it. Throughout the city, new roads look too low, the asphalt is 3 inches below the curb lip. Will another layer of tar be added? Yes , a final layer of asphalt will be added at the very end and the asphalt will be smooth and level. This entry was posted in Uncategorized on October 9, 2014 by wavna305.